I love making books :) Especially now that I finally don't need to look at the instructions anymore. Only took like 8 years to memorize them, ha! Anyway, my friend Nadja found some vintage photos of her mother and wants to put them in a special place. 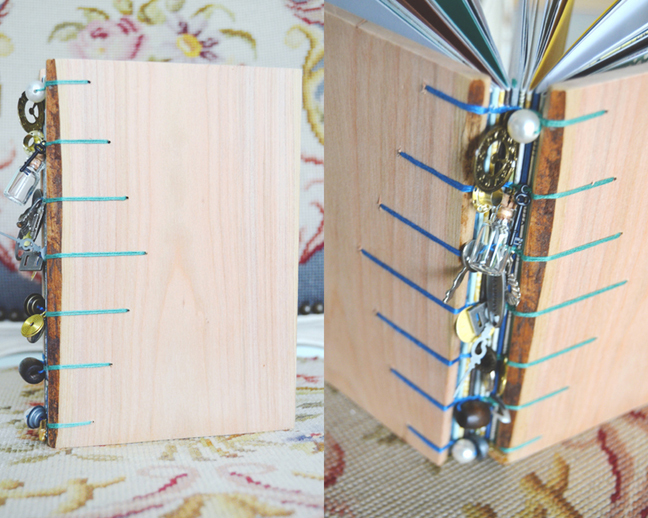 How 'bout a handmade book?! Yesterday I made her book! My dad cut and mailed me a whole bunch of wood covers awhile back - my favorite cover material. The finished size is 5x7 so it'll fit common 4x6 pictures and anything smaller, up to 5x7. I used my favorite type of binding: coptic. If you can poke/punch/drill holes through it, it can be sewn into a book. I used aqua for the first 5 signatures (groups of papers) and blue for the other 5 signatures for a total of 10 signatures. I used all of the patterned papers in the Reflections collection as wells as coordinating cardstock (American Crafts brand of course!) and regular printer paper. As a fun touch I sewed little charms and bedazzles into the binding. I thought about maybe painting flowers on the front, but didn't want to risk messing it up. I should have painted before the book was made - note to self for next time. From start to finish this book took about 2 hours to make. I hope Nadja likes it and enjoys using it for her family photos for future posterity to look through and reminisce! This is beautiful! LOVING all the bits you added on the binding!!! !